With a large colour display and a colour-coded user interface, it’s easy to select the required tests with a single key press, whilst a fast step-through of the test routine makes the testing process speedy and dependable. Whilst small, the SafeTest 60 includes a range of safety tests to enable compliance with a range of international safety standards, including leakage testing to IEC 60601, 62353, 61010 and NFPA-99, earth bond testing to 62353, 61010 and NFPA-99, and insulation testing to IEC 62353. Those involved in testing medical equipment that do not require patient lead testing (e.g. medical beds, operating tables, infusion pumps, hoists, CPAP’s, suction pumps, dentist chairs, medical scales, homecare equipment. Full manual control offers the benefit of executing only those specific tests that are required and provide the user with full control of the power cycles, making testing simple, easy and fast. An automatic warning of secondary earth/ground paths ensures users are made aware when invalid readings are made, thus ensuring correct and accurate test results first time, every time. 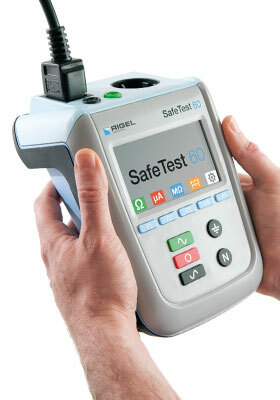 The SafeTest 60 is available in a wide range of power configurations to suit local and international markets, and is supplied with a protective carry case as standard. Method 2 wire ZAP technique. Size (L x W x D) 225 x 150 x 100mm / 9 x 6 x 4"